Jiminy Peak is the largest ski area in Massachusetts, and among the Best Ski Resorts in New England if you count extra points for proximity to Boston. Located in the Berkshires, this resort is as popular in the summer for symphony and theatre as it is the winter for skiing and riding. 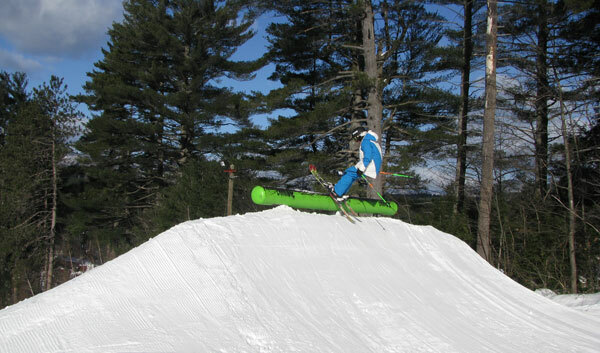 Jiminy Peak is a winter snow-sliding playground. Jiminy Peak Resort village includes the Paul Major Welcome Center, all-suite Country Inn for overnight on mountain lodging, and a state-of-the-art Children’s Center for ski and snowboard lesson programs, and on-site ski resort childcare. As Massachusetts’ largest resort, with 1,150’ vertical and a six-passenger high-speed Berkshire Express lift plus two quads Widow’s White and Whitetail and three triple chairs, Jiminy is equipped to handle the Mass families that head west to ski this 2,380′ summit. Jiminy is convenient and complete for families learning to turn, with everything emanating for one base village. Jiminy Peak has success getting kids and adults started on skis and snowboards with their Terrain Based Learning – TLB, a perfectly tailored ski slope that provides turns and rolls and just the right pitch to teach skiers the basics before they graduate up the mountain. Sister ski resorts Bromley in Vermont and Cranmore in New Hampshire offer similar terrain ski lessons, learn to ski programs and ticket reciprocity on certain passes and programs. Among the 45 well groomed trails at Jiminy Peak, 22 are lit for night skiing. Family friendly trail names like Wild Turkey, Bear Crossing, Racoon’s Den and Deer Run, the kids will enjoy the playful nature of Jiminy, plenty of snow fun for a weekend here. Skiers and riders will find the longest trail is 2 miles long Left Bank. Jiminy has three terrain parks, progressive in nature so that young kids can hit the small terrain park Grommetville, before going bigger at the next Coyote Ride and Alex’s Park, after they acquire their Stomping Grounds Park Pass proving they know the code and have Slope Style Smarts about terrain park etiquette. Just watch the terrain park safety video and take the quick quiz online to get your Jiminy Peak park pass. For added mountain fun at Jiminy Peak, there is a Mountain Coaster and a Soaring Eagle, so you don’t have to ski to enjoy the rush of Gravity at Jiminy. For après ski in Jiminy Peak village, there’s Christiansen’s Tavern. Kids will enjoy the Kids Rule ski and après ski programs at the Burbank Children’s Center. For lodging, families will find the All Suites condo style hotel at Jiminy Peak’s Country Inn, and vacation homes for rent, are perfect right at the base of the ski hill so you and the kids can walk to everything. You will soon notice Jiminy Peak’s windmill on the summit of the mountain, the Zephyr, part of the Peak’s green effort, which provides almost 30% of the ski resorts energy in season. Jiminy was the first ski resort in North America to install wind power on their slopes and has won the Golden Eagle Award from Cliff Bar and the National Ski Area Association for environmental excellence.